Today at assembly the student leaders got their badges. They have a silver background with the Panmure Bridge school logo on it. The badges also have the student leaders name on it. 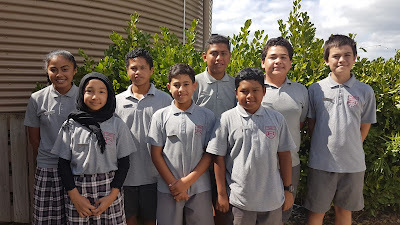 Under our names, are our positions (Head students, Sport leaders, Manaiakalani leaders). The badges look awesome! Kia Ora Mackenzie here from Grey Main School all the way in Greymouth! Congratulations on your badges. What other badges do you guys have to get? It would be really cool if you could put your names and what you go it for. At our school we can get badges to for our year 7 and 8 students who show leadership in 5 areas. I think the badges do look amazing. Kia Ora Panmure Bridge School. I am Liam from Grey Main School in Greymouth. Well done on getting them badges. You all must be really proud of yourself! Kai Pai. My name is Jayden I go to Karoro School. I live on the West Coast of the South Island in New Zealand. My favorite thing on the West Coast to do is to go in the bush and build huts and tracks. Congratulations on your badges they sound really cool and would look pretty good with your grey uniforms. Maybe next time you could take a photo of the badges even if it's with your chromebook that would be good but it's also good to give details about the badge like you did. You could also tell us if you get different badges aswell and say its not your only badge if you have gotten awarded before with them. Kia Ora Panmure Bridge School. My names Lillie, I'm from Karoro school in the South Island. You look like an amazing class and you also look like very hard workers and very kind senior students! I love your uniforms, and I love that you have your school logo on them. It must be pretty awesome to have your name on your uniform. Do you like your new uniform? Who has the positions of Head students, Sport leaders and Manaiakalani leaders? I would love to have all of these!! I also like how you have included a picture of your class and your awesome uniforms but maybe next time you could add a picture of the badges. Your uniform and class looks pretty spectacular!! Well done on getting student leader badges! I like how you have worked hard to get your leadership badges! I think it’s really cool that you have stepped up to help other students learn your strengths! I really like the idea of having badges for students. It’s really cool that you have been chosen for student leaders, good job! I wonder how many different types of leaderships you can do? I wonder if we would be allowed to have badges at our school? Did you have to audition or did your teacher pick student leaders for each subject? Is everyone enjoying their positions so far? Next time you could have a bigger close up on the badges, I couldn’t really see the badges you were wearing. Next time you could also look a bit more joyful, (some of you didn’t look that happy that you’ve got your badge.) Next time you could say what subject you are a leader of now. You are all looking very smart and leader ish with lovely smiles. You all must be very proud of yourselves and I am sure your whānau, teachers and friends are too. I imagine you have all worked very hard during your time at Panmure Bridge School to be given these positions. My daughter was the Head Girl at Kamo High School in Whangarei and I know I was very proud of her. I wonder if some of you have goals to be leaders at High School too. What are your jobs as leaders?